HEAVY LOAD is widely credited for starting the whole Swedish heavy metal wave with its first album in 1978. In addition, they are regarded as the first viking metal band in the world. HEAVY LOAD was founded in the depths of midwinter 1974-75 by the two brothers Ragne Wahlquist (vocals, keyboard and guitar) and Styrbjörn Wahlquist (vocals and drums). Their vision has always been the core of what HEAVY LOAD was all about. 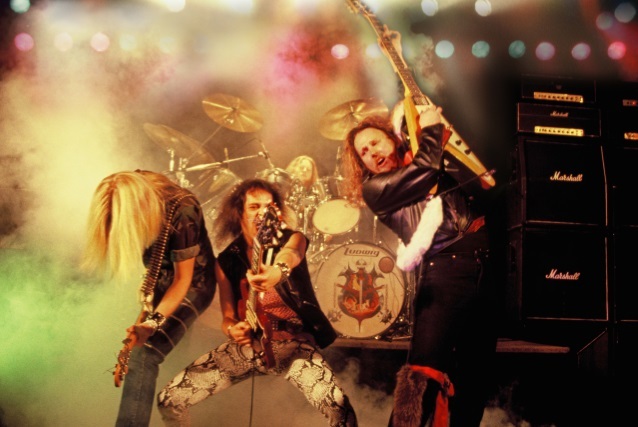 In 1978, HEAVY LOAD released its first album, "Full Speed at High Level", and after expanding the lineup with a second guitarist, it launched its own recording facility, the famous Thunderload Studios, along with its own label, Thunderload Records. On Thunderload, they released such timeless HEAVY LOAD classics as: "Metal Conquest" (1981), "Death Or Glory" (1982) and "Stronger Than Evil" (1983). Now, due to an epic pact between the band and No Remorse Records, the legendary HEAVY LOAD back catalogue will be made available again. The series of ultimate reissues will start with their last album "Stronger Than Evil", and will continue back through their production. These first-ever official reissues will be expanded with bonus tracks: some of these tracks have never been heard by the public before — demos, and songs recorded for the albums which had to be dropped due to the limited playing time on the LPs. In order to guarantee the best sound quality, the reissues have been remastered — by the Wahlquist brothers themselves — directly from the original analogue tapes, at the Atlantis Studio in Stockholm, which is one of the few studios that still have the capacity to handle recordings the old analogue way. At last, the date of the official re-release of "Stronger Than Evil (1983) is set. January 26, 2018, it is to be unleashed upon the world. It will be available in digipak CD, jewelcase CD, LP + CD package, limited-edition box set and in digital download format. The reissue will contain six bonus tracks out of which four never have been available publicly before. Both the CD versions and the LP versions will contain very extensive booklets designed by the Wahlquist brothers themselves. The booklets will feature previously unpublished photos, as well as the band's memories and ideas about the songs. In fact, the CD-booklet will be in thirty-two pages and the LP booklet will be in full LP size. The rest of their four albums are soon to be re-released in similar ways.